At checkout, use the gift certificate recipient's shipping information. 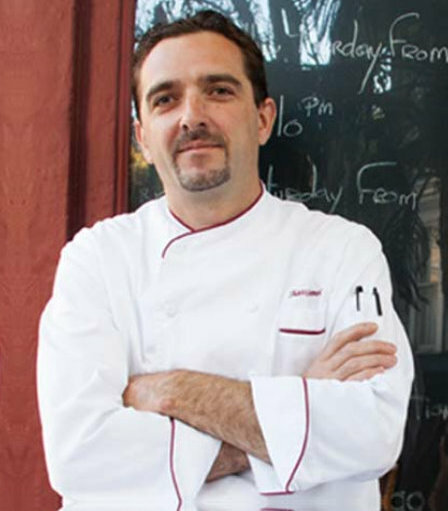 Chef Clement’s professional experience includes three years at Le Charm, a San Francisco bistro, one year at Elizabeth and Daniel, a 2001 James Beard nominated restaurant, and three years leading the kitchen at Fringale, a Basque-inspired restaurant. He then opened his own restaurant, L’Ardoise Bistro in March 2008. L’Ardoise Bistro has been featured in the Michelin guide, and has a good rating in the Zagat Survey, Yelp, and other blogs, plus a few article in the local papers. Born in the French Alps, Chef Clement then moved with his family in central France and worked at his father’s butcher shop. He acquired a taste for fresh, simple food that makes the pride of his hometown’s artisan products and his mother’s home cooking. Chef Clement began spending time in professional kitchens at age 15 and has subsequently begun his education by working in restaurants in Bordeaux, the Pyrénées, and Paris. Chef Clement spent six years in Paris pursuing his love for the culinary arts at venues including The Bistro du Peintre, a typical bistro in the Bastille area; La Cigalle, a small restaurant specializing in soufflés, L’Escargot Montorgueuil, and La Cantine Des Gourmets, a Michelin star rated restaurant. Before moving to the United States, he worked briefly at Fitzer’s in Temple Bar, Ireland, where he was executive chef.